Old folks claim that too much of anything is not good for you, but young folks like Matty in Too Much Glue prove that “too much” is just enough to brighten your day. In Too Much Glue by Jason Lefebvre young Matty is a glue connoisseur. His art projects at school are all glued with generous “glue puddles” instead of sparing “glue raindrops”—much to his teacher’s disappointment. At home, he and his dad make glue glasses, glue mustaches, and even glue castles. Matty’s mom also indulges him by operating the glue gun that helps hold all the gluey creations in place. With such encouragement, it’s no wonder why Matty ignores his teacher’s warnings and squishes globs of glue on his latest project. And when sequins and sparklers aren’t enough to make his new creation stand out, Matty adds something extra: Himself. Yes, Matty glues himself to his masterpiece! Then follows a series of funny, unsuccessful events as his teacher, classmates, the school nurse, and even the principal try to figure out how to un-glue Matty and return the classroom back to normal. 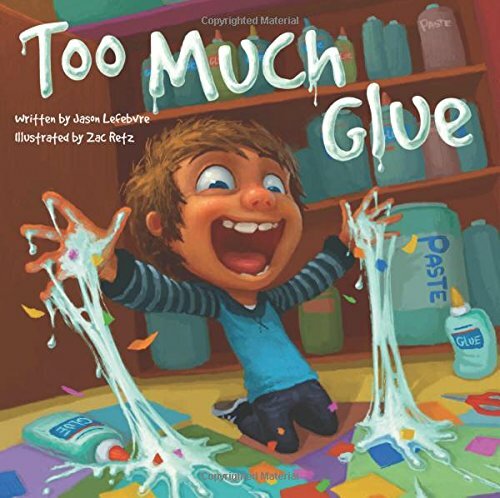 Too Much Glue cleverly captures young children’s love of art, hands-on construction, and messy glue and combines it all with the wonder of boundless imagination. The result is a picture book that’s fun with laughs from the first page to the last. Mr. Lefebvre’s decision to tell Matty’s story in first person is a wise one because it adds immediacy to a point-of-view that children respond to so well. Young readers also get to experience (and identify with) the love and indulgence of Matty’s parents, the patience of his long-suffering teacher, the concern of his school nurse, and the sage wisdom of his principal—all through Matty’s imaginative eyes. Illustrator Zac Retz uses the splendor of computer animation to bring wide-eyed Matty, his gluey hands, and his oozing creations to life. The book is a veritable explosion of color, wild facial expressions and in-your-face activities that children are sure to love. This book is perfect for art time in an elementary class or as a favored book before bedtime. It might be given to a budding artist as a birthday or “anytime” gift, and it’s a definite must-have for library shelves.